Why Are Some Cars Allowed To Evolve But Others Are Not? Every time MINI comes out with a newer, bigger, model the internet lights the torches and sharpens the pitchforks. I understand that a brand called "MINI" is supposed to have well, "mini" cars but unfortunately people don't want to buy "mini" cars they want to buy regular cars with a MINI badge. Yet many of us believe that MINI vehicles should still be this. Once upon a time the VW Golf was a small hatchback. Then it grew, every generation was larger than the last. The Golf had its good years and bad, but few complained about the size. The MKV was a return in quality and dynamics to the Golf we knew and loved from years past. But the MKV was still big by comparison. The MKVII looks to be one of the best versions of the globally loved compact to date. MINI sales have been on a steady decline except for their largest car the Countryman. That makes sense because small doesn't really sell. 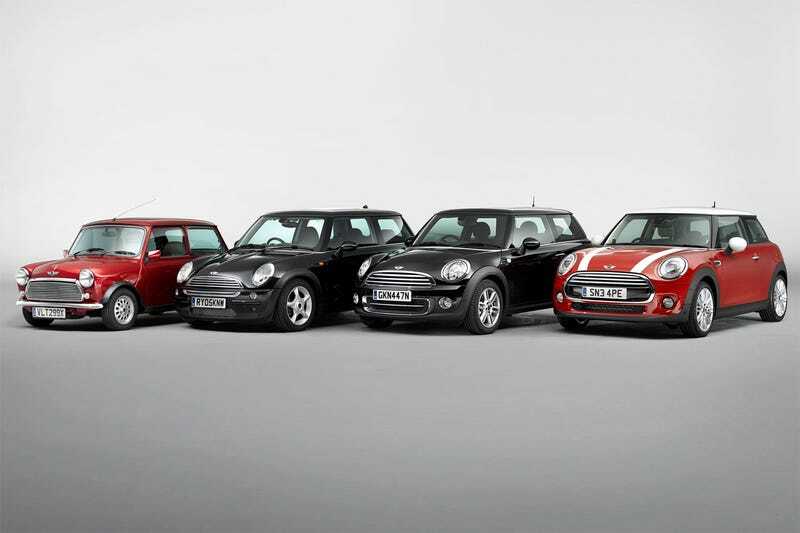 In 2003 the "new" Mini Cooper was released and was an instant hit. I ordered an '04 Cooper S and had wait 3 months for it. At the time the S models were flying off the lots and could only be had with a manual transmission. Three years later my Cooper was totaled in a flood and I thought about picking up another one. I was shocked at the number of lightly used Coopers in the pre-owned market. I asked a dealer at MINI about this phenomenon. He said, "People bought them because they were 'cute and fun' but after a year, reality set in and a lot of people traded them because they were 'too stiff and too small." The next generation Cooper had a significantly softer suspension with the sport suspension being "optional," even on the S models. And The current generation has gotten much bigger, but the larger MINI seems to be a return to the fun and funky car that the '03 was. Most people see MINI as BMW's "youth division" a la Toyota's Scion, as a lifestyle brand meant to filter buyers into BMWs as their income increases. Whether or not that plan comes to fruition is another story. But what if MINI was not so focused, what if MINI was more like VW to Audi? And therein lies MINI's problem, the brand doesn't know how it wants to occupy the market. I'm rather fond of the Jetta Sportwagen (Golf Variant), it is a fun car but not really a "performance" car. However, if the Clubman offers a nice turbo-4 with an available, sport suspension, and 6-speeds, that would make me very interested. Is the this bigger Clubman concept moving the MINI brand farther from its roots? Probably, but it might move it closer to something us Jalops might really dig.